Synopsis: Who is the real Margo? Quentin Jacobsen has spent a lifetime loving the magnificently adventurous Margo Roth Spiegelman from afar. So when she cracks open a window and climbs into his life - dressed like a ninja and summoning him for an ingenious campaign of revenge - he follows. After their all-nighter ends and a new day breaks, Q arrives at school to discover that Margo, always an enigma, has now become a mystery. She has disappeared. Q soon learns that there are clues in her disappearance ...and they are for him. Trailing Margo's disconnected path across the USA, the closer Q gets, the less sure he is of who he is looking for. 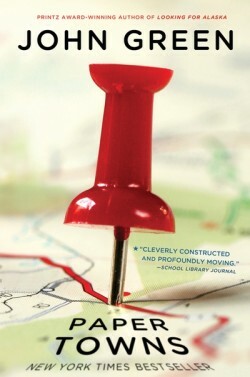 Paper Towns is John Green’s third solo novel, and having the pleasure of being able to read his novels in publication order, there is something curious to be noticed about Green’s writing. That is, that Looking for Alaska, An Abundance of Katherines and finally, this novel, almost share their characterisation- that Paper Towns is simply a progression of the story told in Green’s previous two works. This is, I believe, the Green Factor- his signature move, himself incarnate in his novels, his Midas touch. It is what makes his novels so reassuringly familiar (and yet, they are so very unfamiliar at the same time). Green works with a sort of heightened reality in his characters. Whilst a fantasy novel’s heightened reality is in its setting, or a thriller in its plausibility, in Paper Towns, it is in the characters. Margo is an eccentric, forever planning pranks and escapades that take her to Mississippi or elsewhere. Quentin is almost normal, and yet throughout the novel he is deeply insightful and questioning. Radar is a computer geek whose parents own the world’s largest collection of black Santas, Ben, inherently flawed but also inherently funny. What Green really capitalises on, though, is the flaws of all the characters- predominantly Margo’s near-suicidal and/or depressive thoughts and Quentin’s assumptions about other people. And it is these things that really make Paper Towns what it is: an exploration of brokenness and perception and humanity, and to a lesser extent than in Looking for Alaska and An Abundance of Katherines, love. Unlike his other novels, Paper Towns is primed for the big screen. There are scenes within its pages that are so funny and so wonderful, that it surprises me that film-makers have not yet risen to the bait. Perhaps it is because Paper Towns is such a complex novel that covers so many different themes, or maybe it is simply for more mundane reasons. Either way, a film adaptation of Paper Towns would blow all previous coming-of-age dramas out of the water. There is something about a bildungsroman that John Green does so well: over and over again he has shown us how it’s done. And it could also be that our familiarity with him and his writing also increases enjoyment. One thing is for certain: his novels are witty, profound and heart wrenching all at the same time, in a way only John Green can write. So just read Paper Towns, and see for yourself- and perhaps, discover a few truths about yourself along the way.